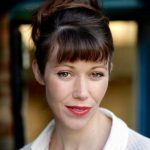 Savasta’s French play has been translated to English by Kirsten Hazel Smith. However, the translation and accessibility does not end there. Sign language plays a crucial role in the production as Nadia Nadarajah plays a deaf adoptive mother, Youmna. Nadarajah’s sign language is verbally matched by Charmaine Wombwell’s, Nour, adoptive daughter of Youmna. They sync up in unison as they converse in two contrasting forms of communication. Wombell’s verbal translations address the audience directly, establishing a connection with the character as we travel along with her on her mountainous journey. Rajha Shakiry’s set further aids the blend between the verbal and sign language. Clean white boards harbour Nina Dunn’s simple but effective projections contribute to establishing each section of the journey’s setting. 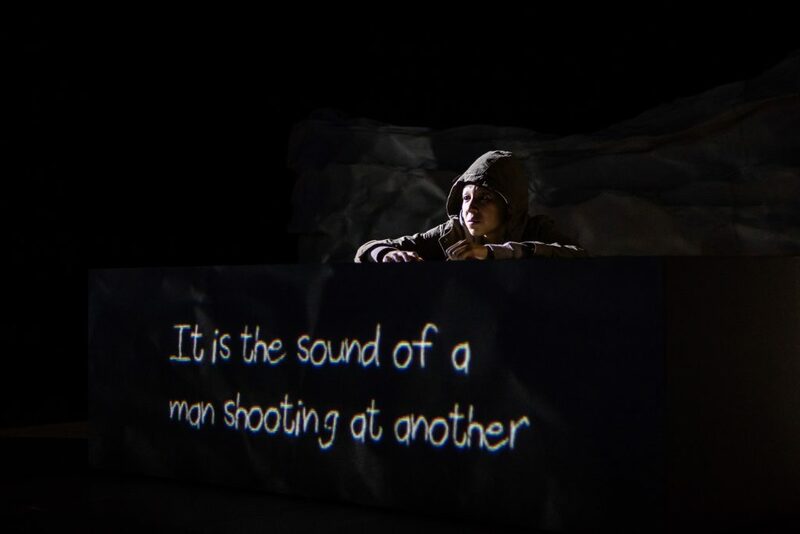 The projections display subtitles during parts of the narrative, translating for those who cannot interpret sign language and delivering the odd piece of silent dialogue from an actorless character. The subtitles also place emphasis on certain moments, causing them to linger in the mind, welcoming speculation and heavy waves of pathos. The cast of two are wonderful to watch, Wombwell’s Nour takes centre stage as the protagonist; she is brave, defiant yet understandably terrified all at once. She faces travelling with complete strangers, avoiding gunfire and having to hide her true gender with a half understanding of what happens to young girls in such a hostile environment. Nadarajah’s Youmna is also particularly compelling, without even having to understand sign language, one can understand her stoicism, humble nature, and deeply rooted love for Nour. Ahead of Going Through’s UK premiere at the Bush Theatre, the show’s translator, Kirsten Hazel Smith spoke to us about working on this pertinent piece. Hi Kirsten, Going Through will make its UK premiere at the Bush Theatre ‪from the 28th March until 27th April‬. How are you feeling ahead of the run? I’m so excited! I can’t wait to see the play up on its feet. I translated Going Through from the French Traversée almost four years ago, and it has always been my belief that this story would shine on a British stage. Going Through is a translation of Estelle Savasta’s play Traversée; a show placing focus on a young migrant’s journey across borders in hopes of a safer life. What drew you to help translate the production? The moment I read Traversée I was struck by the story, which felt so relevant as the news continually spoke of the Mediterranean migrant crisis. I also fell in love with Estelle’s beautiful and inventive writing. So I fought for the play to be selected as one of the plays translated by Cross Channel Theatre – an initiative that seeks out French new writing – and I am very grateful that I was given the opportunity to translate it. Have you watched both the french and UK versions of the show? If so, how have you found watching both versions? Are there any similarities/differences in terms of how ideas/themes are explored/presented? I didn’t see the French production, and the English production is currently in rehearsal, so I haven’t seen that either. Estelle created Traversée in the rehearsal room and then wrote the script, so there’s a fascinating visual aspect to her writing. She also invents her own French: the young girl Nour whose journey we go on uses her own unique way of describing things, so this was a wonderful challenge for me. Have you learned anything new from working on this production? Having never before worked on a production (either as a translator or as an actor) that has BSL as such an integral part, it has been captivating to watch Nadia Nadarajah who plays Youmna and the Associate Director Louise Stern at work. Audiences can expect a beautiful story, inventively told and powerfully performed. I think it is vital that we explore the human stories behind the immigration facts and figures that politicians and newsreaders chuck about. But also I would like audiences to realise that there is a wealth of wonderful young playwrights coming out of France and Europe at the moment, and we would enrich our own theatre by celebrating them. What advice would you give to any aspiring translators? Find a play that you love. It is so much easier to translate something that you are passionate about. I loved getting to work with Estelle, so much so that I am currently translating her latest project Lettres Jamais Ecrites, which will be presented as a reading at 4pm Thursday 26th April at the Bush Theatre.Questions by Lucy Basaba.